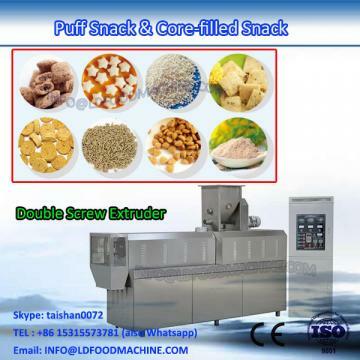 The Corn Snack make machinery adopts corn, rice, wheat, oat, barley etc as ingredients to make puffed snack. Through friction of screw and barrel, the grains are cooked in the extruder. Forming is at the die face cutter. The product shape is determined by a combination of the die aperture, including ball, tube, stick, ring, fruit loop, star, wheel and flower ,cornetc.